BNP senior leader Moudud Ahmed on Saturday warned that the government will have to face a ‘strong student movement’ if it does not stop ‘repressing’ those involved in quota-reform movement. “The quota-reform movement has no link with any political party. But the government has showed its intolerant attitude by repressing Rashed, Nuru, Sohel, Tariqul and others who were leading the movement,” he said. Zia Adarsha Academy arranged the programme at the Jatiya Press Club, demanding BNP chairperson Khaleda Zia’s release from jail and her proper medical treatment. 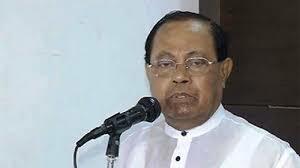 Moudud, a BNP standing committee member, said the government is citing a High Court verdict regarding freedom fighters’ quota as an excuse since it is not willing to reform the quota system as per the Prime Minister’s commitment. “People aren’t fool to understand that the High Court’s verdict can’t be any obstacle to reforming the quota. If there’s any verdict, the government should take steps to review it so that the Prime Minister’s pledge can be kept by reforming the quota,” he observed. “I (PM) had earlier spoken of cancelling the entire quota system. But, there’s a verdict of the High Court in this regard. If I defy the verdict, I'll face contempt of court,” she added.